Here is a look back at a Sicilian recipe I posted a few years ago that is one of my all-time favorite pasta dishes. 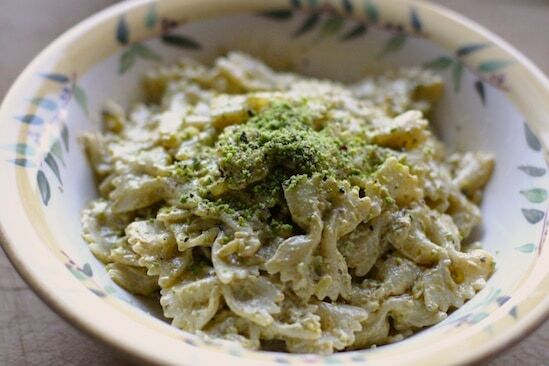 While it might seem too hot right now for a heavy cream sauce, I crave pistachio pasta all year long. It’s so simple and quick, the sauce will be finished by the time your pasta is cooked. Pair it with a crisp salad and I think it’s a great way to end a long summer day. This dish is a dream! I couldn't think of any sauce I'd want to eat more. Bookmarked! Stop by my blog- you got an award! :) Blessings! We made a pistachio cream sauce once before and it was amazing. Might have to give this one a try, we love a good, simple pasta! Sounds great. I like pasta with pistachio pesto too. I will have to give this a try. Mr. B is a massive fan of both pistachios and pesto. He would grin from ear to ear if I combined both in a pasta dish. I am seriously drooling here! Another delicious dish. I am looking forward to trying it. I love that the pistachios are ground. I don't care for large chunks of nuts. I took a stab at this over the weekend. I used orrichette instead of farfalle, just because I always keep orrichette on hand, but it turned out fantastic. Next time I think I'll add a bit more pistachio, but you can be sure - there will definitely be a next time!Pics (not nearly as nice as the ones in the recipe) etc. are here:http://www.thisiswhatimeating.com/2010/07/26/dinner-at-home-with-friends/Great recipe - thanks for sharing! While making our menu for the week my husband requested farfalle with pistachio...like we had during our time in Sicily! How funny that a google search pulled your site up and it appears our times there overlapped a little! Thank you for the recipe and the small trip down memory lane - I try not to think of it much, as we miss it so terribly!